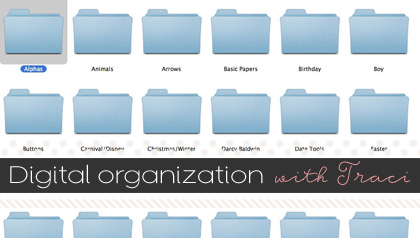 Tutorials by Sweet Shoppe Designs » Digital Organization: So Many Methods, So Little Time! Hey Hey Sweet Shoppers! 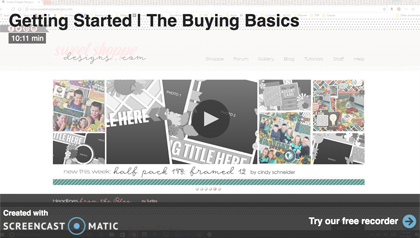 Traci here with a little glimpse into how I organize my digital supplies! There are so many ways you can organize and really, it’s up to you to decide what works best for you. I’m typically a kit scrapper and I stay within the confines of a kit, and really only pull in outside alphabets and stitching here and there so the method I’m going to show you today will work best for scrappers who scrap like I do. In future instalments, we’ll go over the other ways people organize their digi kits too! So, if you’ve been at this a little while, you know that your files stack up fast once you’re an avid digital scrapper. Most likely, you’ve found a method that works for you when you unzip your files, but what happens after you’ve got them unzipped? Do you throw them all into a folder by designer? Or maybe even by store? 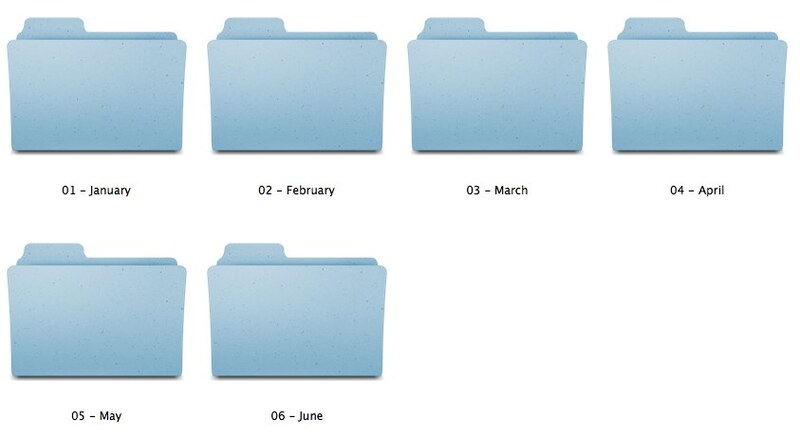 I used to organize this way but after a few years found out that it just wasn’t working for me. I never knew where to look for “that one Halloween kit that had the cute Frankenstein in it”. Ah, descriptive. Because all of my files were organised by store and then designer, I had no idea where to start looking! I was constantly coming across kits that I forgot I even had and even repurchased things that I didn’t know I’d already bought (oops…this happens to the best of us!) 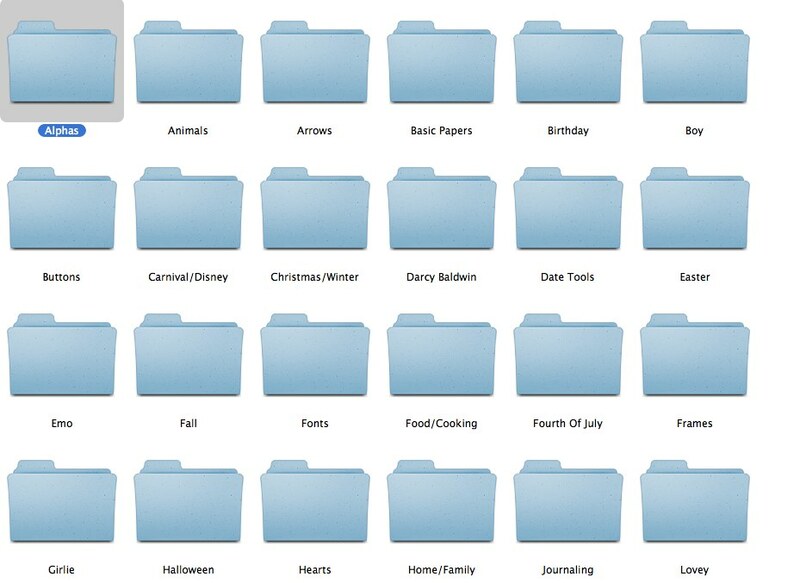 So I took matters into my own hands and decided to organize instead by theme…voila! Now, instead of having to remember who made “that one Halloween kit that had the cute Frankenstein in it”, I have all my Halloween supplies in one spot and can easily look there instead! Speaking of, let’s look inside the Halloween folder, shall we? 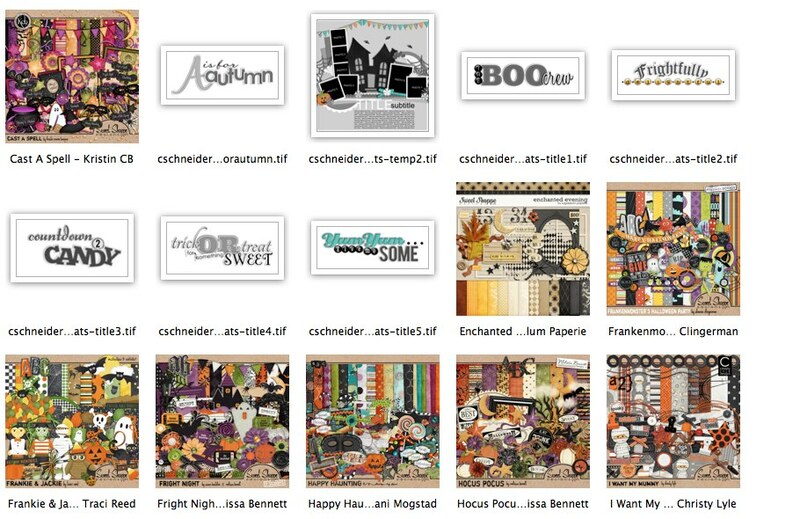 I *gasp* took themed items like word art and templates OUT of their original folders! I do this because if I stuck the themed templates in with the rest of my templates (you’ll see how these are organized in a minute) then I really would lose track of them. By putting the Halloween themed templates in with the Halloween kits, when I open up my Halloween folder I see that I have them! On a Windows machine, copy the kit preview in the folder and name it folder.jpg and it will become the thumbnail for the folder. Open the kit preview in Preview. CMD + A to select all. CMD + C to copy. Close the kit preview an open your folder for the kit. Click in the white space to make sure no files are selected. Hit CMD + I to open the information dialogue for the folder. Hit CMD + V to paste the preview image. If you’re like me, you have approximately 1.5 billion templates. No, not that many? OK well I have almost that many. I love a good template and can’t scrap without them. I used to have my templates organized by whatever pack they came in with the preview as the folder thumbnail for my kits and guess what? I figured out that wasn’t working for me. 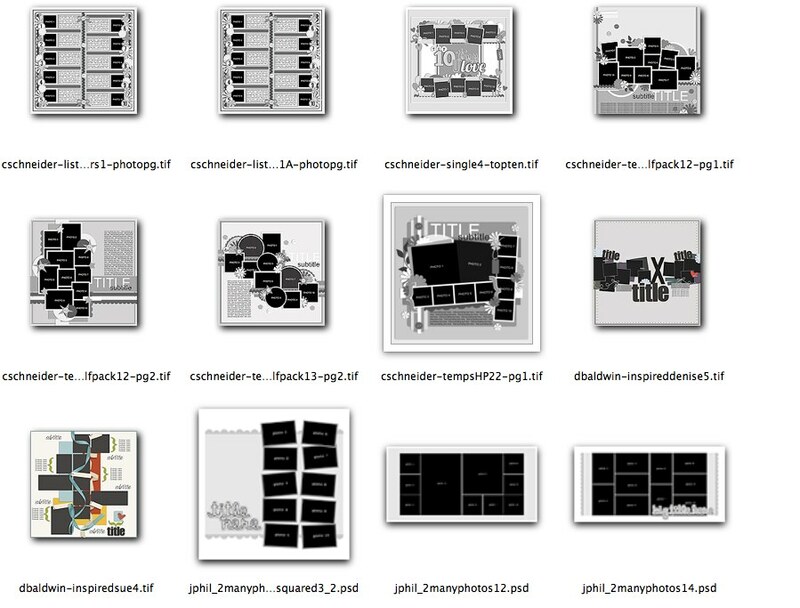 Because I nearly always start with the photos I want to scrap, I ended up organizing my templates by number of photos. I know for a lot of us, it’s counter-intuitive to break up designer’s products but most designers nowadays are really good about naming their files fully so we still can credit them fairly easily! Ay-yi-yi, organizing your photos can be the most daunting task there is and if you don’t stay on top of it, you can lose track of what happened when fairly easily! Some programs will create a folder named with the date you import your photos, some photo import programs like iPhoto, create new “events” every time you import photos. The results can be utter chaos. 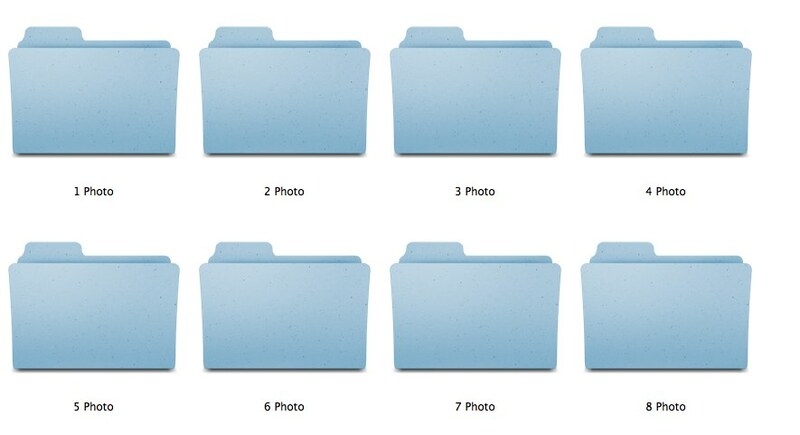 I choose to organize my photos in the way that makes the most sense to me: by the date the picture was taken. 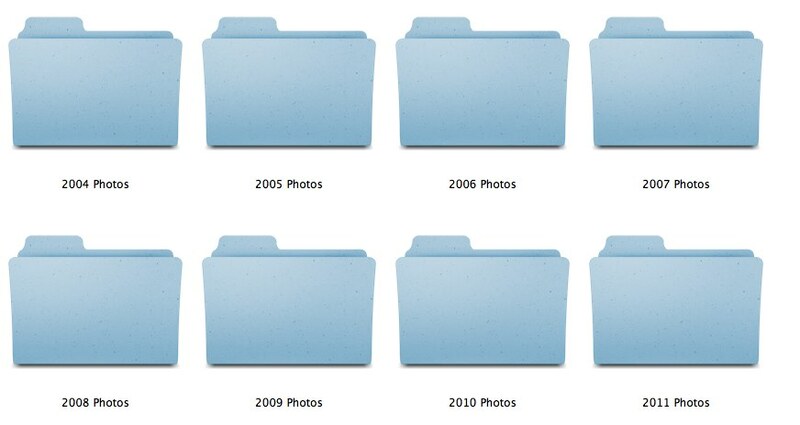 This is the easiest way for me to find photos and keep everything organized chronologically. That way, if I want to look for a certain date, I don’t have to figure out what the date was exactly when I happened to take the photos of the camera. That way, the layouts stay in chronological order, grouped by year so that no matter when I scrapped the layout, they always stay with other layouts from the same year, which is my preference. Now like I said waaaaaaaaaay back at the beginning, this is just what works for me, perhaps you see something in this that you’d like to do for yourself as well or maybe you’re looking at it going “that makes no sense at all!” The most important part is that you find a method that works for you and STAY organized. There’s nothing worse than trying to organize AFTER the fact! Stay tuned in coming weeks and I’ll show you other ways that people like to organize! Some really great methods here Traci!! 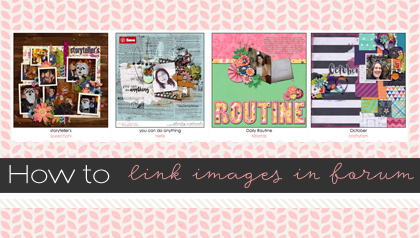 I absolutely love your idea for organizing kits by theme – going to try that one for sure! Thank you. Nice to know I’m on the right track. 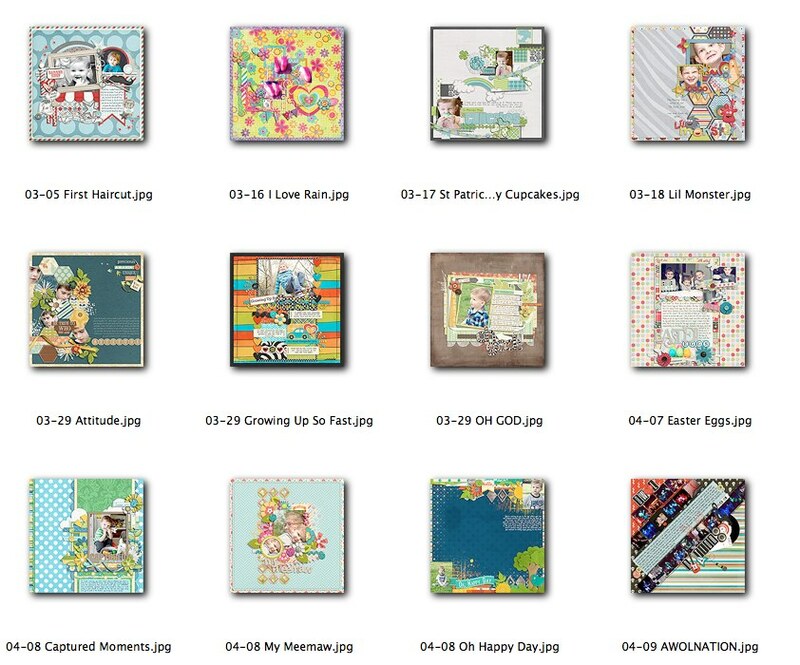 Sometime last year I switched to the Theme method for organizing my digital scrapbook stash for the same reasons you described. So far it’s working very well! I organize my photos and completed layouts just like you described also! Too bad the rest of my life isn’t as organized!! Love the way you named your finished layouts with the date first!!! I may have to go back and do that to mine…ok, maybe not go back and do them all but start naming them like that now!!! Thank you for sharing!! This is very similar to my current method, except I started re-organizing by theme a while back and never finished! So my poor Kits folder is quite a mess now. You’ve inspired me to finish that process! 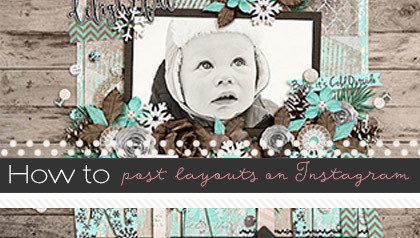 I also have long organized my templates by number of photos and it works like a charm for me. Except for all those templates I just dumped in the Template folder instead of taking the extra few seconds to put them in the right one… sigh. Now I know what my weekend project will be! Love how you organize your templates! I do by designer. But I’m going to do it your way. Thank you for sharing. I file my kits like you under events= Holidays, Seasons, Events, Mom, Dad, Boys, Girls, Travel, Etc. I also have an Elements Catagory which I file fonts, actions, adornments, brushes, bows, ribbons, frames,etc. (I save special ones I really like under a subcategory by color…so if I need one for a quick page they are easy to find by color). I also have my Quick Pages with subcatagories like Mom, Dad, Kids, Seasons, Holidays, Travel, etc. I know this is redundant and takes upn a lot of space but it works well for me. Thanks for the tip on the folder.jpg thumbnail. I like your photo saving tips also. Super excited about that changing the kit previews to be my thumbnails. I’ve always wanted that, but didn’t know how. thanks! I use all the methods that you have stated here. However under the year with the pictures, I put all the pictures with the particular date in the same folder and label it as to the function. I wish more designers would name their preview of their kit, qp, or template with the folder.jpg name so that when it unzips, you already know what it is. Can you spread the word to designers??? Thanks for all the tips love your site. How do you organize the kits that aren’t necessarily a “theme” kit? I put each kit in it’s own folder with the kit name and by (so Fancy Pants ~ Traci Reed) and then put that folder in the theme folder I think it fits in. Deleting the TOU is up to you, if you never plan on using the kit for anything other than scrapping, then I think you’d be fine, though they normally have contact info in them. Yes, I have some button packs that I purchased a long time ago that are in there. I don’t break up kits. what if it’s a collab how do you organize that one. All the parts in one folder and the another folder that says collab? I keep the collab together and put it in it’s theme folder. I don’t organize by designer. awesome i think i got it… you have been a great help! I just may get organized except I have 3 1tb hard drives to go through Ugh! First, I have a big folder called preview and in it, I organize a copy of preview. 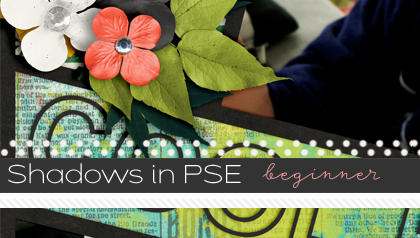 The previews has a code (oo1 for Spring, 002 for Summer….) and I can chosse the kit and find it quickly. And finally I have a big folder called “embelissements” and then I have a lot of sub-folder for buttons, stiches, tape, journaling cards and so on. I’m agree with you: is necesary to purge every month. When time past go I notice that it’s easy to see wath I’m sure that in a future I’ll use and what I’m sure that I never used… Also some kits, years after are completed off… and I’m sad but I’m obliged to erase. I hope you understand what I means beacause I speak french and spannish but my english is not very good. I am a little late to the game, but I have two questions. Do you keep your original layered docs in the same folder with your JPGs? I have been saving both. It looks like you are a mac user, but do you have any idea why saving folder.jpg isn’t working in windows 7? I do not keep PSD files. I also don’t have a windows machine, so I have no idea why that wouldn’t work! Apologies! I love your method of organization. Can see where I need to do some changing so I can find what I’m looking for quicker. Hi! I read over this, and I just accidentally found an AMAZING shortcut for mac users to make ANY image or file type become your folder icons without having to open in Preview. You just have to select the image that you want AND AT LEAST ONE MORE (the 2nd file doesn’t matter, but it’s the magic to this trick), then copy them (cmd + c), get the info for the folder you want to change the image of (Cmd + i), click the small folder icon in the top left, and paste (cmd + v). DONE!! I only wish designers would make their preview images/folder.jpg files on a folder so that it’d be easier to tell that they are folders with contents, and not just a preview file… And to include alpha preview pages too… Here’s to hoping!